Full of expectation someone unscrews the jam jar ... and suddenly the last fatigue vanished! There's nothing but absolute emptiness! No jam is dust-dry toast for breakfast! 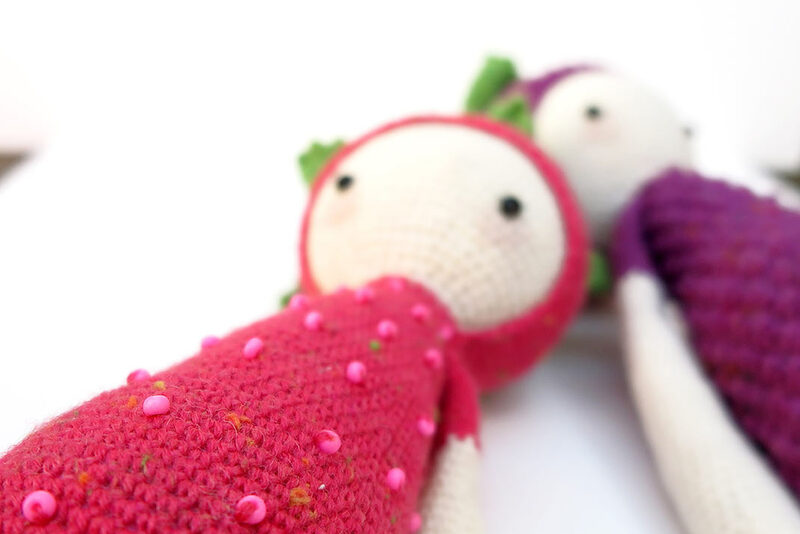 ERNA and BERT have known each other since they wore little flowers back in their very early years. They grew up together in the same backyard with numerous brothers and sisters. After the successful graduation on the tree nursery ERNA worked as a cake topping in a cupcake bakery (get her secret cupcake recipe). BERT always enjoyed tinkering. He invented a device that could make phone calls mobile. 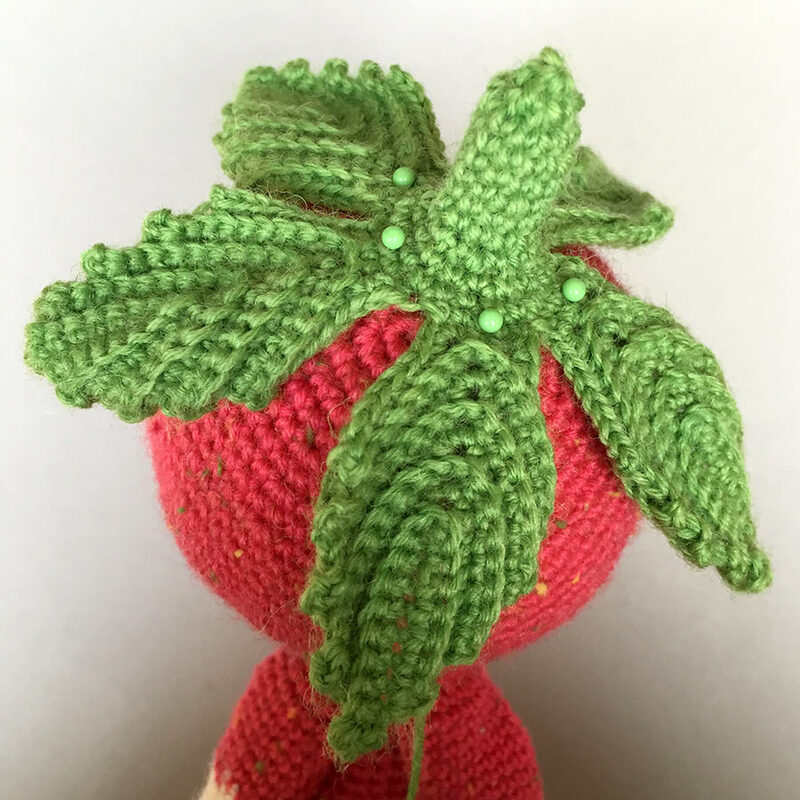 With the money that he earned when he sold his idea, ERNA and BERT opened a greengrocery. No, not the kind of greengrocery you might know! It’s a place where the lalylala fruits and vegetables meet and spend their time together. There is also a spa where the stressed-out city fruit can relax in a hot tub full of milk or recover it's skin with a refreshing yogurt mask. There’s also a juicer for those who need a massage for loosening. ERNA and BERT are totally into chocolate. They love the color green, springtime and they got a big library filled with horror books (cookbooks about how to make jam, jelly or marmalade) and they are scarily fascinated by Martha Stewart. 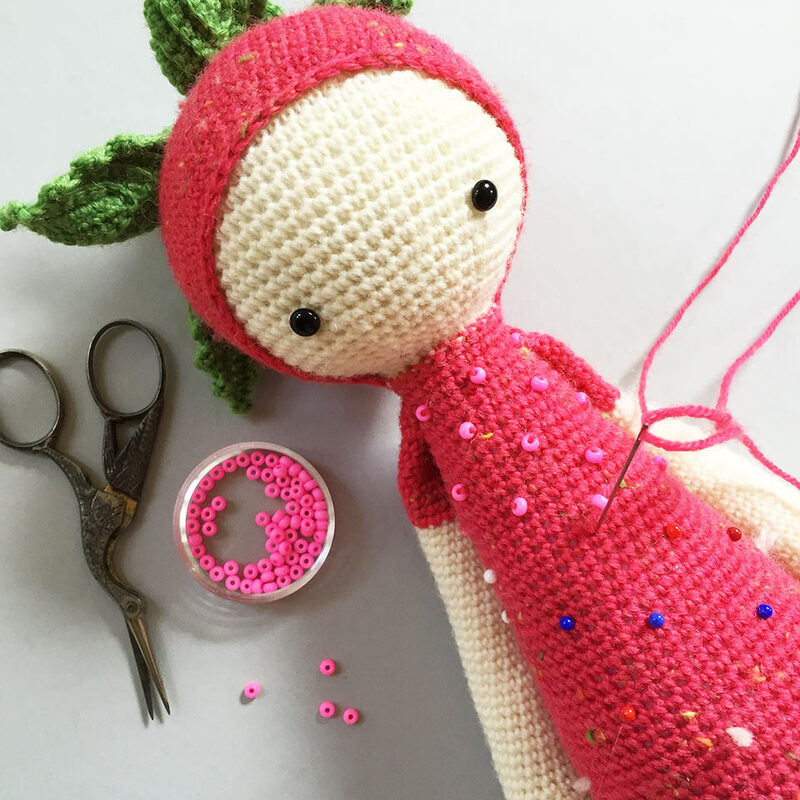 for the basic doll body you need the lalylala crochet pattern "LUPO the lamb"
DANISH and RUSSIAN pattern versions coming soon! Thanks for your patience! 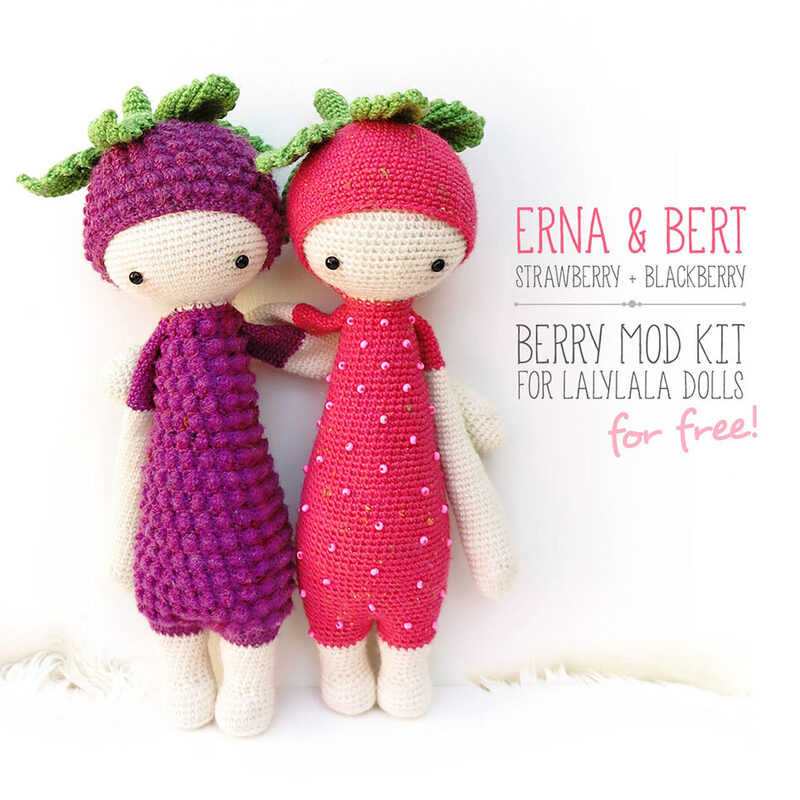 For the body of ERNA or BERT a commercial lalylala pattern is required! CHANGE COLORS from white to pink for the last 4 rounds of the legs (it's round 19-22 or in case you use VLAD's pattern it's a change from pink to white for rnd 51-54) and for the last 9 rounds on the arm (rnd 41-49). 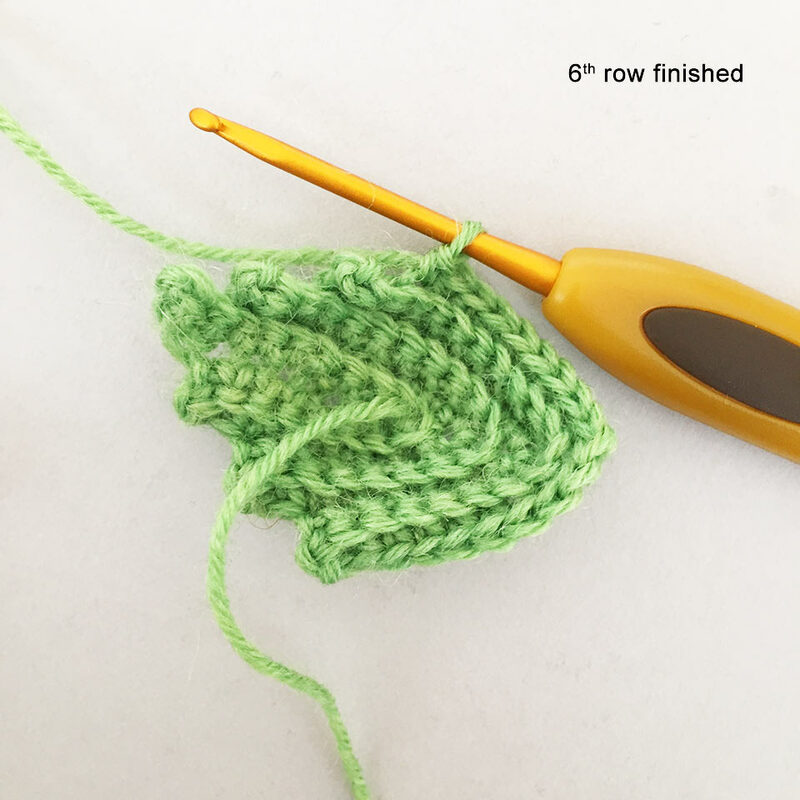 Follow the crochet pattern of LUPO the lamb and change colors as the pattern calls for. Use white instead of brown and purple instead of natural color. 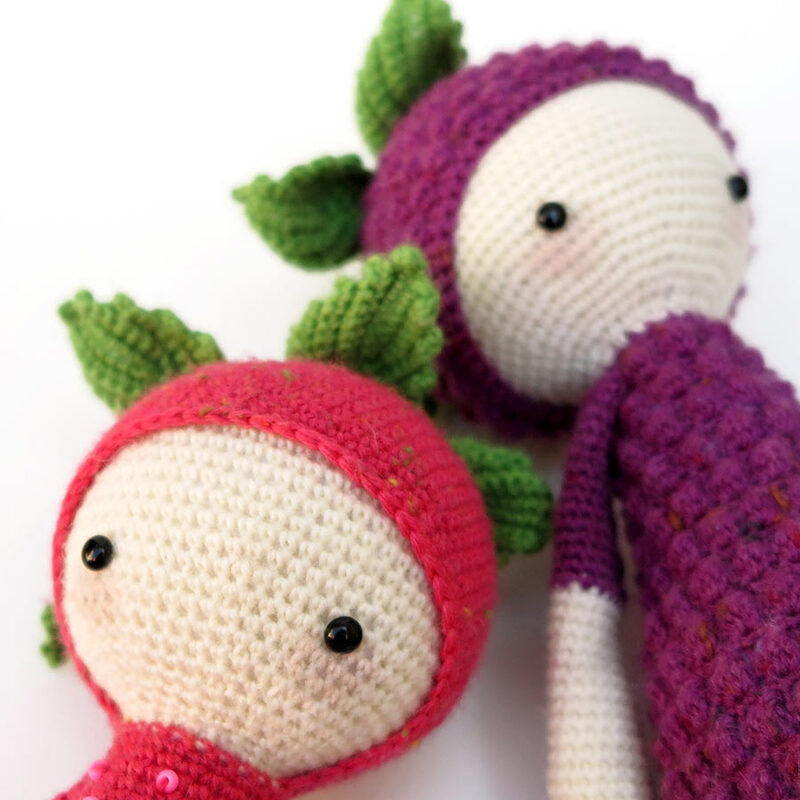 You can also make a raspberry from the same pattern - just use pink yarn instead of purple. Du brauchst eine der käuflichen lalylala Häkelanleitungen, um die Körper von ERNA und BERT zu häkeln. Para el cuerpo de ERNA o BERT necesitas haber adquirido un patrón de lalylala! Pour le corps de ERNA ou d‘ BERT un patron payant lalylala est requis! FARBWECHSEL von weiß zu pink nimmst Du für die letzten 4 Runden der Beine (Runde 19-22 oder für den Fall, dass Du nach VLADs Anleitung häkelst: Wechsel von pink auf weiß für die Runden 51-54) und für die letzten 9 Runden an den Armen vor (Runde 41-49). Usa cualquier patrón de un muñeco lalylala que tenga dos piernas y una capucha y que se teja con medio puntos (sirven todos los patrones, menos el de OLEG y LUPO). CAMBIA DE COLOR, de blanco a rosa en las últimas 4 hileras de las piernas (son las hileras 19 a 22 o, en caso de estar usando el patrón de VLAD, el cambio es de rosa a blanco en las hileras 51-54) y en las últimas 9 hileras de los brazos (hileras 41-49). CHANGEMENT DE COULEURS de blanc en rose pour les 4 derniers rangs des jambes (ce sont les rangs 19-22 ou si vous avez utilisé le patron de VLAD le changement se fait aux rangs 51-54) et aux 9 derniers rangs du bras (rangs 41-49). Elk patroon dat twee benen en een kap heeft en gemaakt is met vaste steken (alle patronen behalve Oleg of Lupo) is geschikt voor het lijf. VAN KLEUR VERANDEREN: begin de benen met wit en haak de laatste 4 toeren van de benen met roze verder (dit is toer 19 - 22). Bij het patroon van Vlad begin je met roze en haak je tot toer 51 - 54. Voor de armen begin je met wit en haak je daarna voor de laatste 9 toeren met roze (toer 41 - 49). CAMBIA IL COLORE dal bianco al rosa per gli ultimi 4 giri delle gambe (ovvero per i giri 19-22 o, nel caso seguissi lo schema VLAD, cambia dal rosa al bianco per i giri 51-54) e per gli ultimi 9 giri delle braccia (giri 41-49). Um Bert's Körper zu häkeln, brauchst Du die lalylala Anleitung "LUPO das Lamm". Du folgst der Anleitung und den enthaltenen Farbwechseln 1zu1, nimmst jedoch statt des braunen ein weißes und statt des naturfarbenen ein violettes Garn. 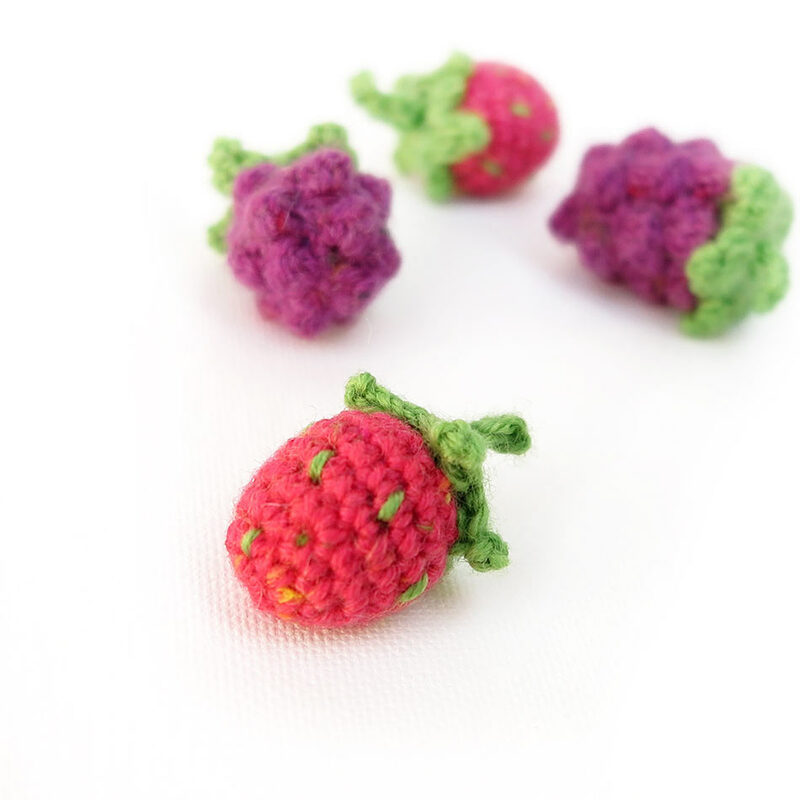 Aus BERT lässt sich auch prima eine Himbeere machen - Häkel ihn einfach in pink statt violett. Sigue el patrón de la oveja LUPO y cambia los colores pedidos en el patrón. Usa blanco en vez de marrón y violeta o morado en lugar de color crema o beige. También puedes hacer una frambuesa con este mismo patrón – Tan sólo usa fucsia en vez de violeta o morado. Suivez le patron de LUPO l’agneau et changez de couleurs comme indiqué sur le patron. Utilisez du blanc à la place du brun et du violet à la place du coloris naturel. 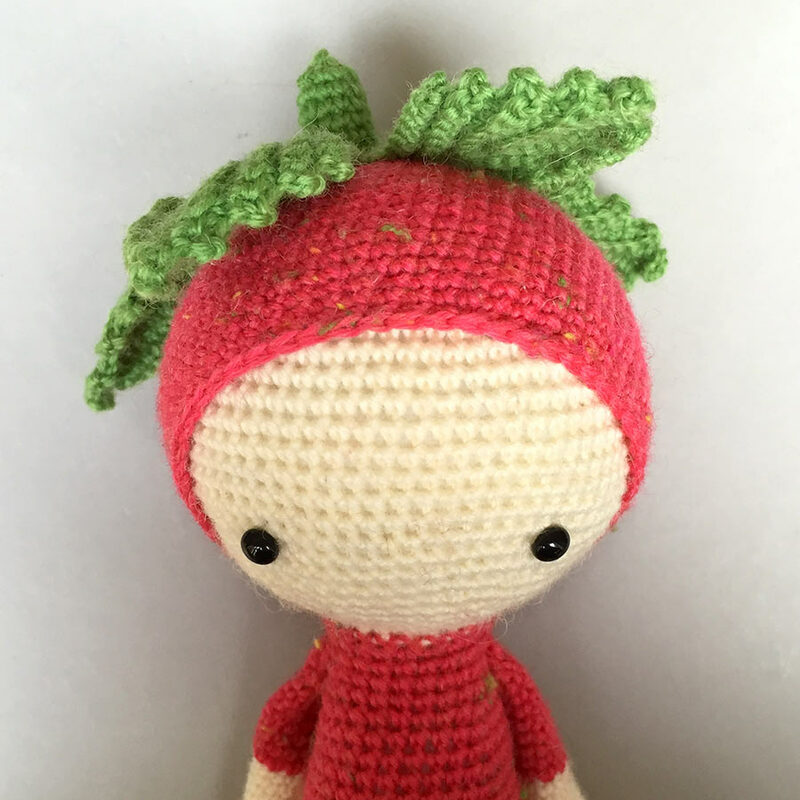 Vous pouvez également réaliser la fraise en suivant le même patron – utilisez donc du rose à la place du violet. Gebruik het haakpatroon van lammetje Lupo en verander van kleur zoals aangegeven in het patroon. In plaats van bruin gebruik je wit en paars in plaats van crèmekleur. 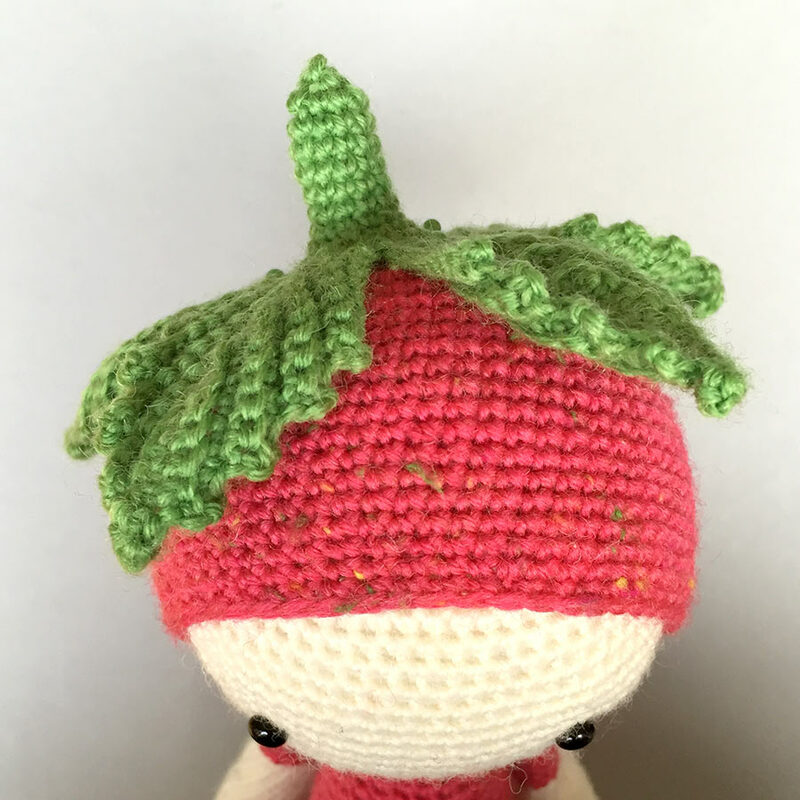 Met dit patroon kun je ook een framboosje maken met roze garen! Segui lo schema all’uncinetto con le istruzioni per realizzare LUPO l’agnello e cambia il colore seguendo le istruzioni. Puoi anche realizzare un pupazzetto lampone seguendo lo stesso schema - basta utilizzare del filato rosa al posto di un filato viola. You need 5 sepals at all to join them to a rosette. 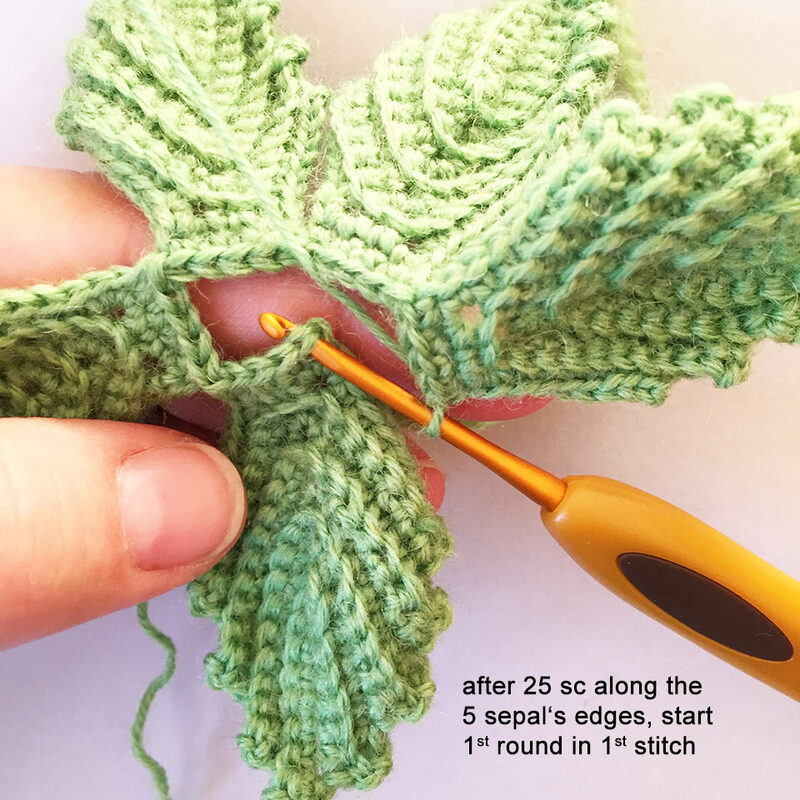 For the fist sepal you start with a chain of 11 ch. Now break the yarn and weave in ends - Alright one done - further 4 to go! 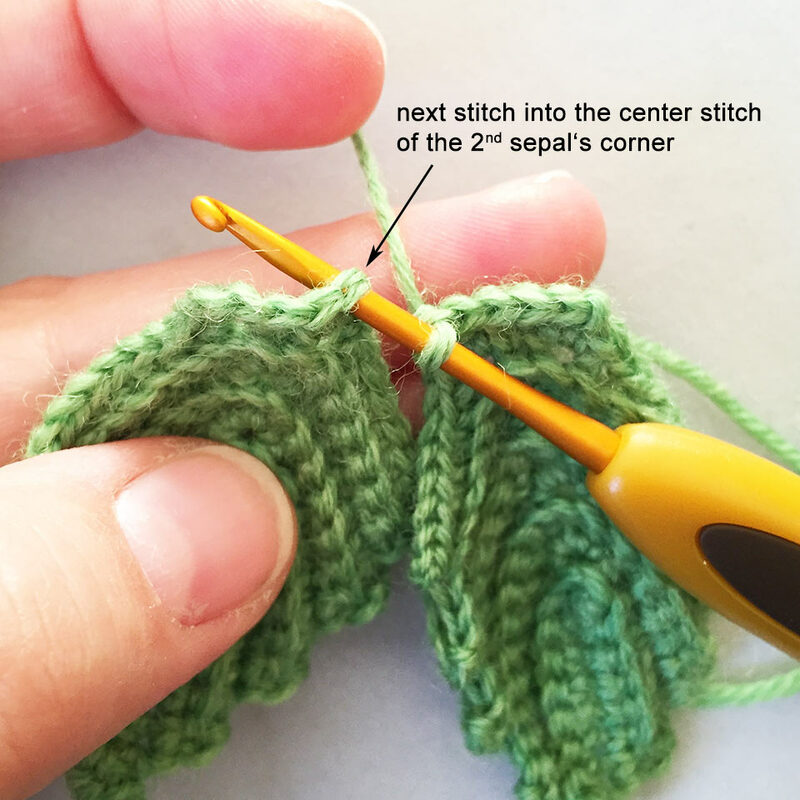 Find an illustrated step by step photo turorial following to this box. Ab nun werden alle Maschen nur noch in die hinteren Maschenglieder gehäkelt! Jetzt schneidest Du das Garn ab und vernähst die Enden. Ein Blatt fertig - noch 4 zu häkeln! Dann mal los! 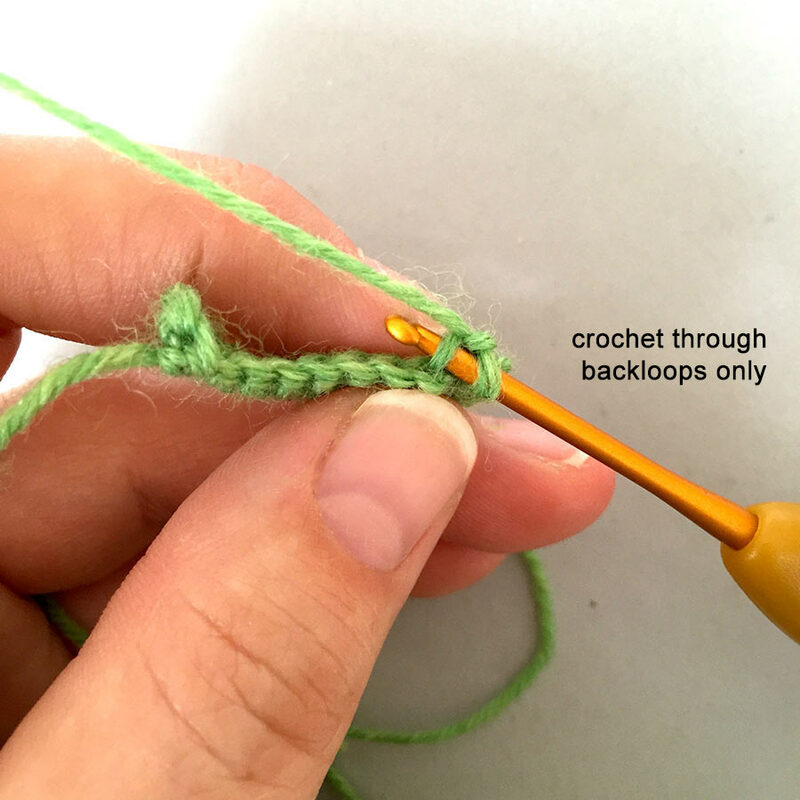 Gleich unter dieser Box findest Du ein Schritt-für-Schritt Foto-Tutorial für die Blättchen. Corta la lana y entreteje los sobrantes. – Bien! Una lista… quedan 4 más por hacer! Coupez le fil et rentrez les bouts. Une de faite ! Il en reste 4 ! Knip de draad af en werk het eindje weg. Eén klaar, nog vier te gaan! een gedetailleerde uitleg met foto's. Realizza 5 sepali e uniscili per realizzare una rosetta. Per il primo sepalo avvia una catenella di 11 maglie. Blocca, taglia e ferma il filo tra il lavoro - Ecco il primo sepalo - passa a realizzarne altri 4! 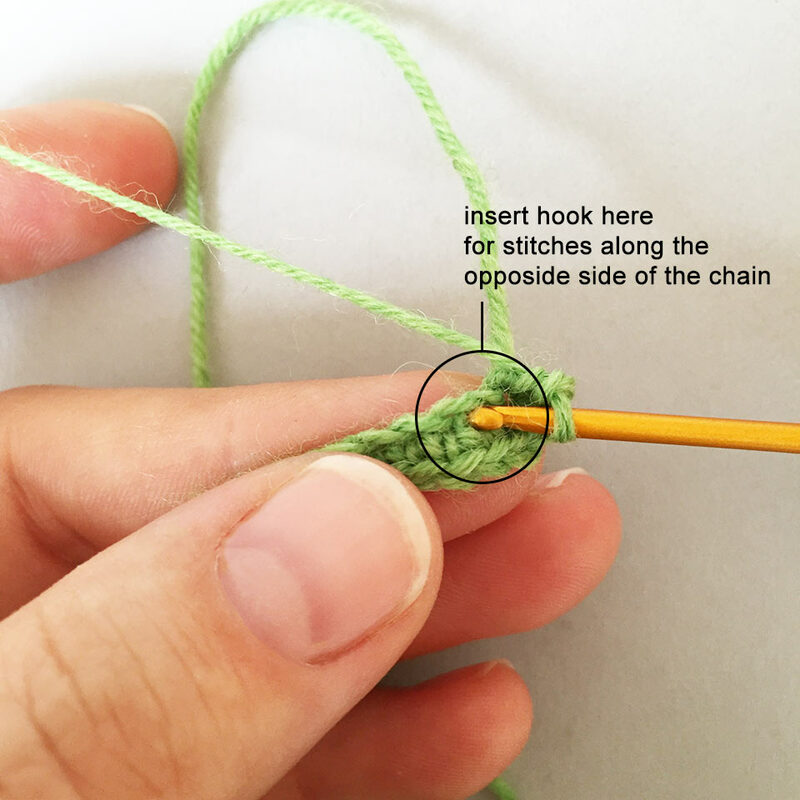 un tutorial di immagini che illustra tutti i passaggi. 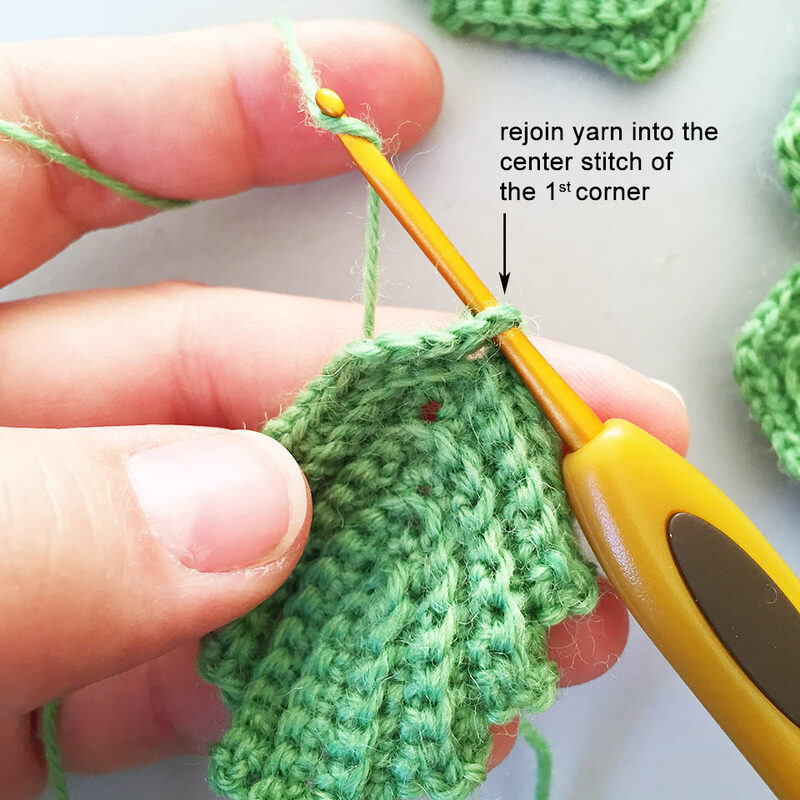 Take a first leave and rejoin the yarn in the center stitch of the leave's right corner (it should be the stitch in the middle of the 3 sc you've done in row 8). 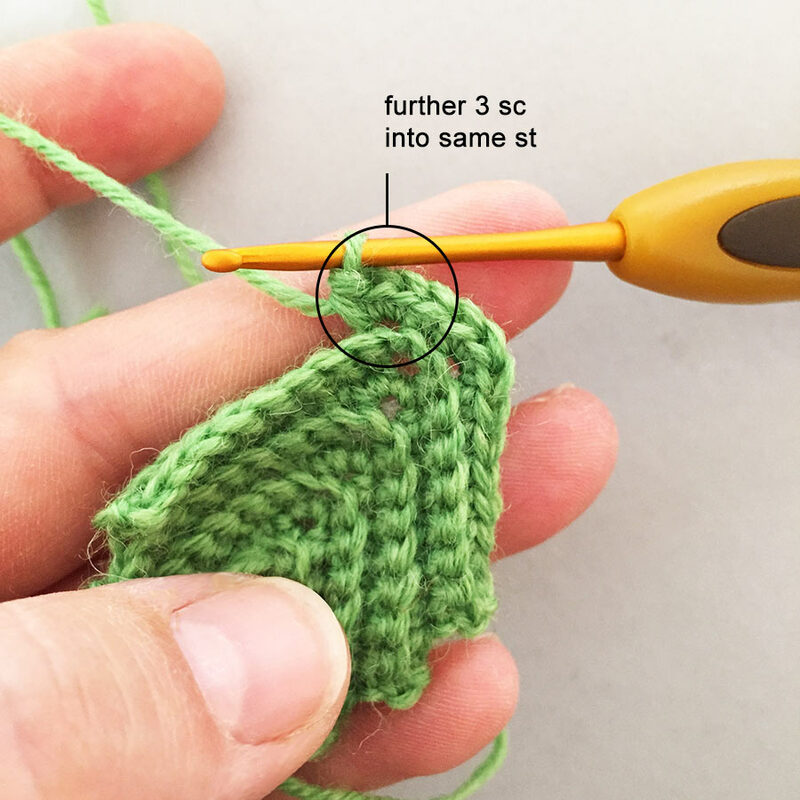 Crochet a first sc into the same stitch as join and work further 4 sc along the edge. Take a second leaf now. 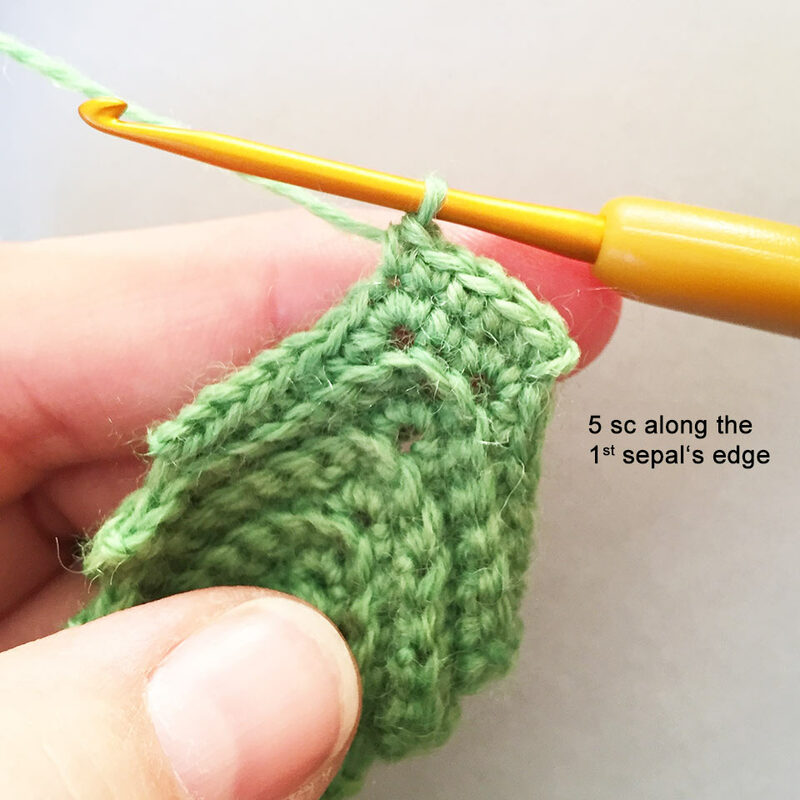 To assamble the leaves, insert your hook into the center stitch of the 2nd leaf's right corner and crochet a first sc into it. 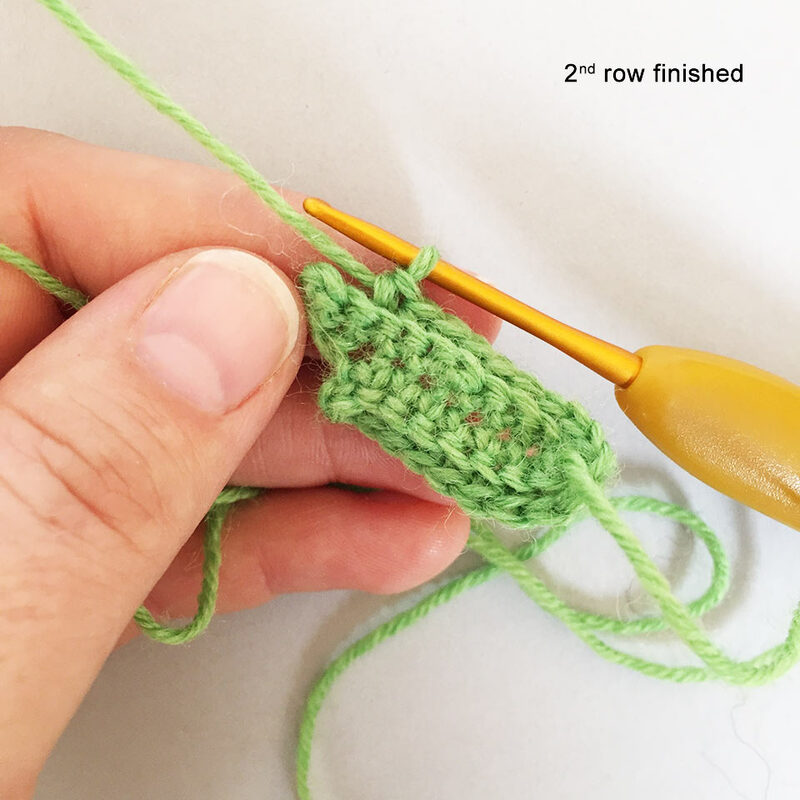 Work further 4 sc along the edge of the second leaf. Join all the sepals like that. When all leaves are lined up you got 25 stitches done. 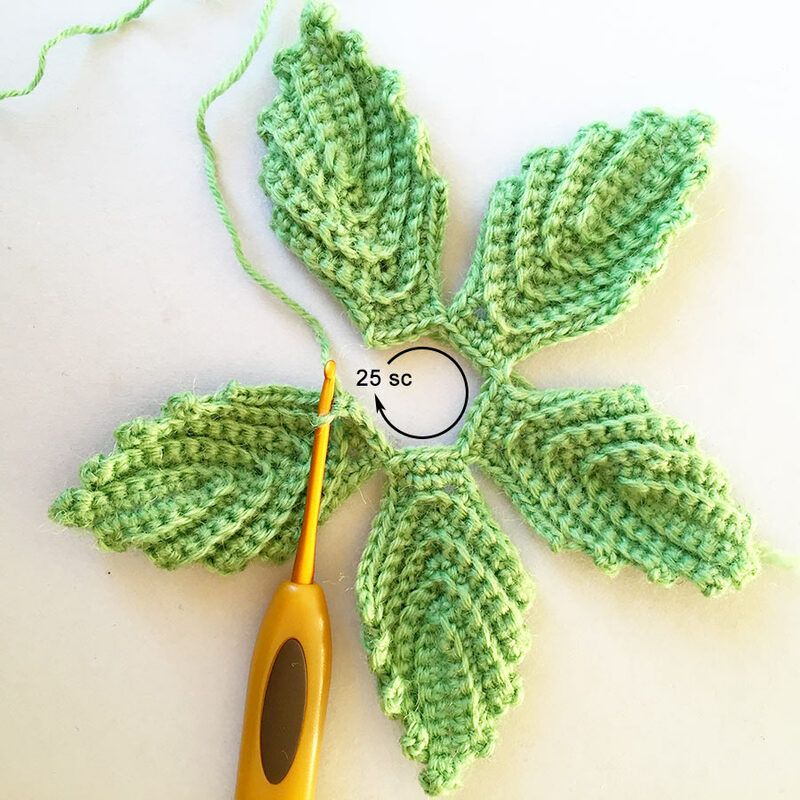 You have to join your leaf-garland to a ring now. 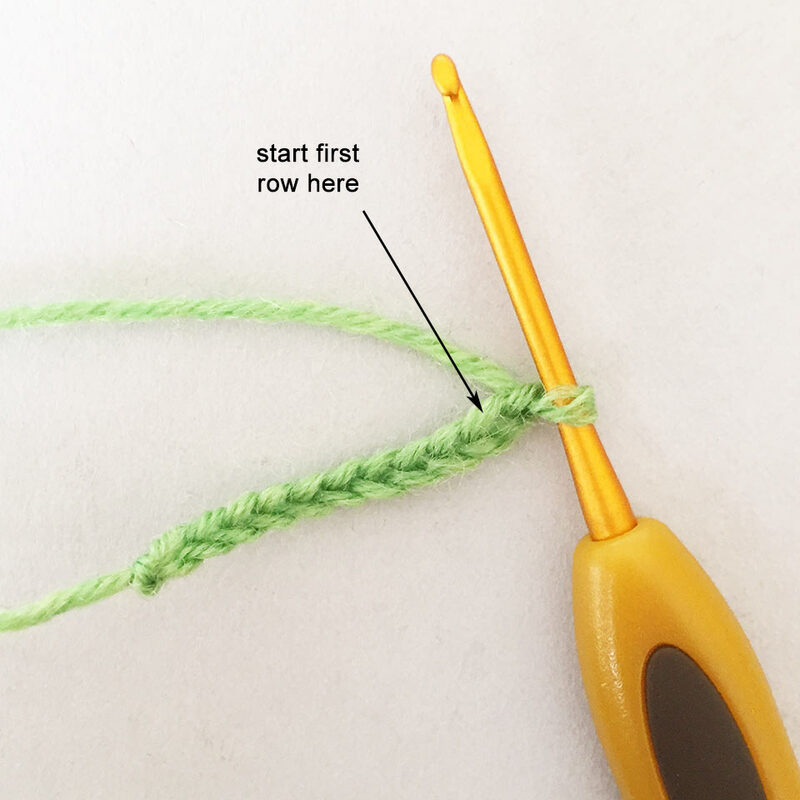 To do so, start the following round 01 directly into the 1st stitch you've made on the first leaf. From now on you work in a spiral. 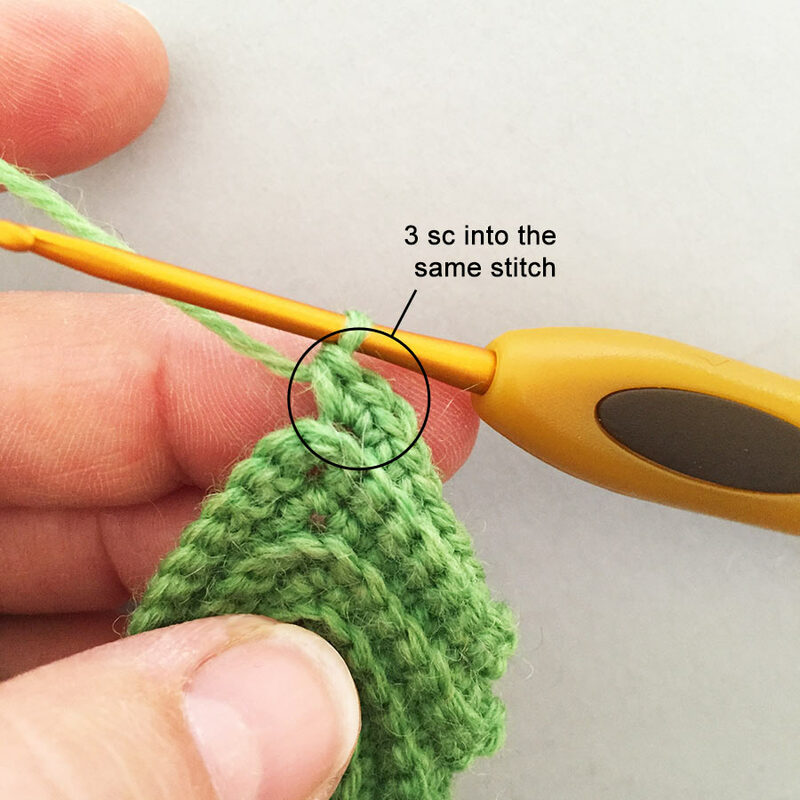 To keep the right count, place a marker into the 1st stitch of the rounds. 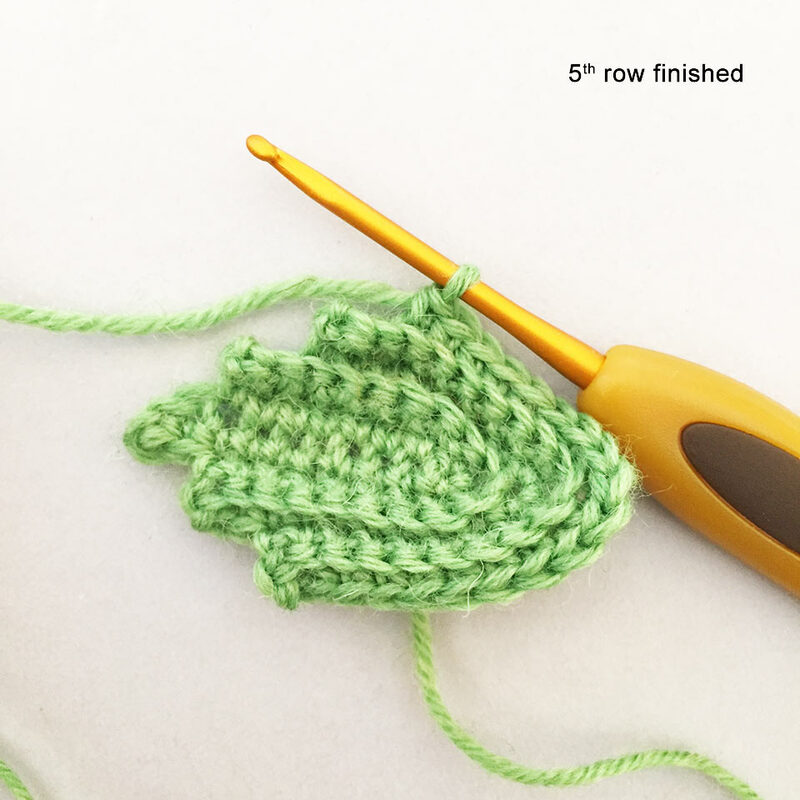 Break yarn and fasten off the remaining 5 stitches. 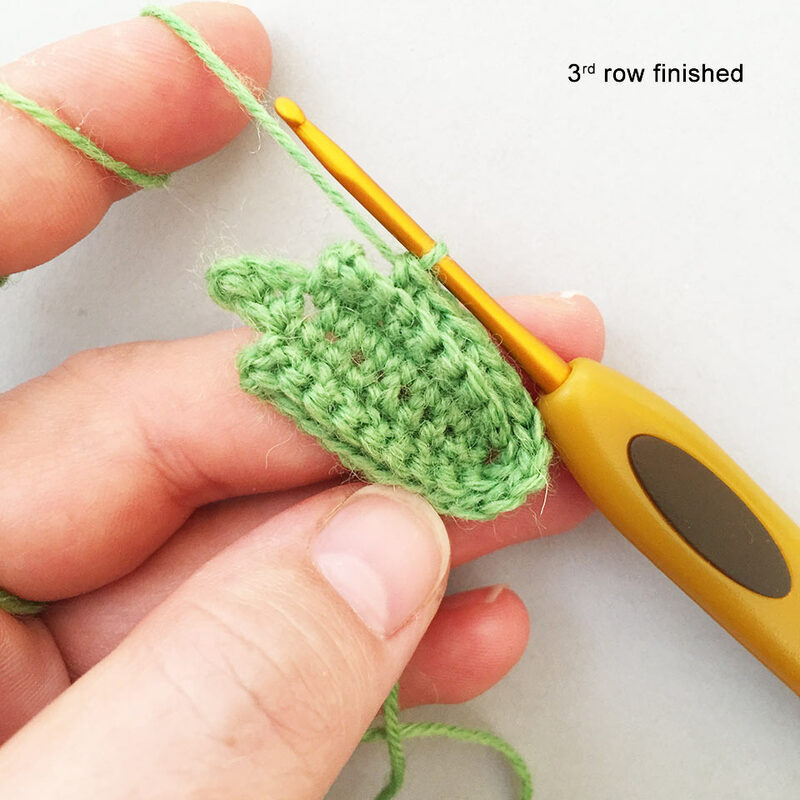 remaining stitches in the round. Schnapp Dir ein erstes Blättchen und nimm das Garn in der rechten oberen Ecke - in der mittleren der 3 Eckmaschen aus der 8. Runde - wieder auf. Dann häkelst Du eine erste fM in die gleiche Masche und weitere 4 fM in die folgenden Maschen entlang der Kante. Jetzt nimmst Du ein zweites Blättchen zur Hand. Um die beiden Blätter miteinanfer zu verbinden, stichst Du nun mit der Häkelnadel in die mittlere Masche der rechten Ecke des 2. Blattes. Häkel 1 fM in diese Masche und 4 fM in die Maschen entlang der Kante des 2. Blättchens. Verbinde alle 5 Blätter auf diese Weise. Wenn alle Blätter miteinander verbunden sind, hast Du insgesamt 25 Maschen gehäkelt. Von nun an häkelst Du in einer Spirale weiter. TIPP: Plaziere einen Maschenmarkierer in die erste M der Runde, so fällt das Zählen leichter. Schneide das Garn ab und schließ die übrigen 5 Maschen. 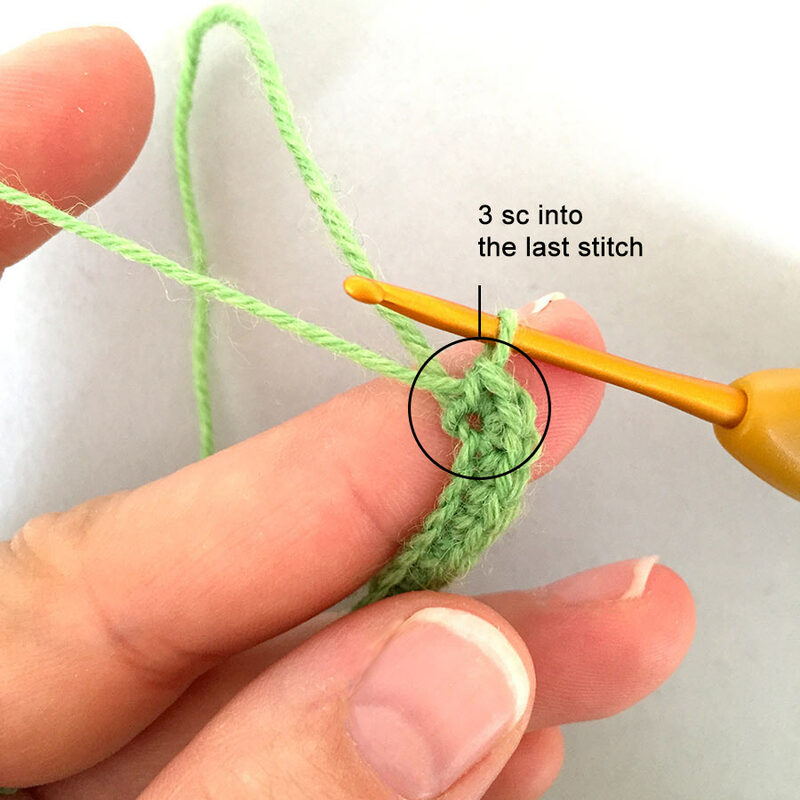 Wie werden die verbliebenen Maschen in der Runde geschlossen - Tutorial: "how to fasten off remaining stitches in the round". Toma la primera hoja y reinserta la lana en el punto central de la esquina derecha (debería ser el punto en el medio de los 3 mp que has hecho en la hilera 8). Teje un mp en ese punto como unión y has 4 mp a lo largo del borde. Toma la segunda hoja e inserta el ganchillo en el punto central de la esquina derecha de la segunda hoja y has un mp. Luego 4 mp a lo largo del borde de esa segunda hoja. Une todos los sépalos de esta manera. Cuando hayas terminado de unir todas las hojas , tendrás 25 puntos. Ahora debes unir tu guirnalda de hojas para formar un anillo. Para hacerlo, empieza la hilera 1 en el primer mp que hiciste en la primera hoja. De ahora en más trabajaremos en espiral. Para no perderte, coloca un marcador de puntos en el primer punto de cada hilera. Corta la hebra y ajusta los 5 puntos restantes. los puntos restantes en la hilera. Prenez la 1ère feuille et commencez dans la m centrale du côté droit de la feuille (cela doit être le centre de la ms3 faite au rg 8). 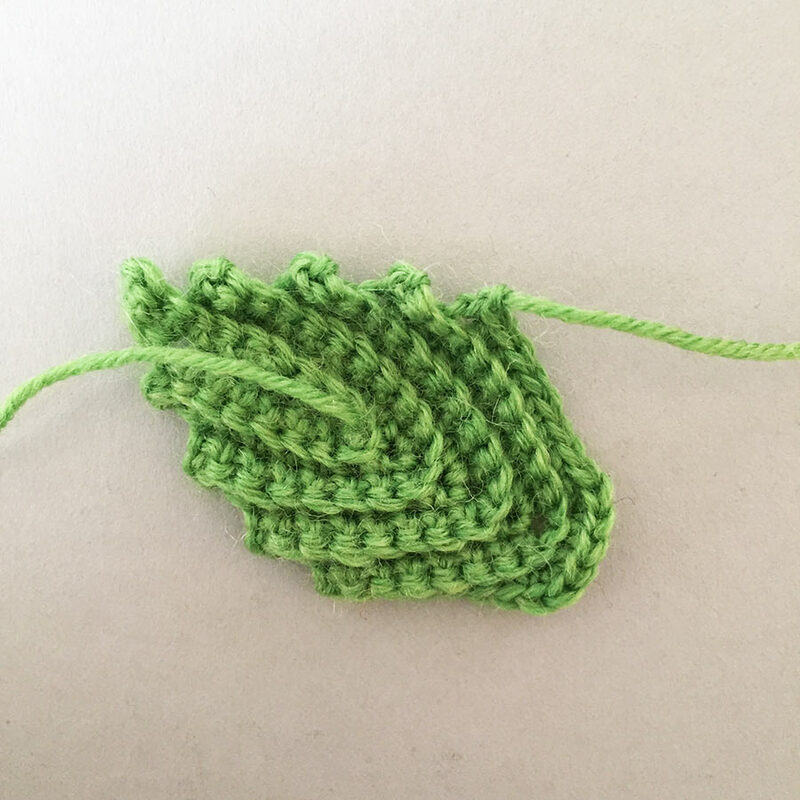 Crochetez une première m dans la m dans laquelle vous avez commencé et réalisez 4ms le long du côté. Prenez maintenant la seconde feuille. 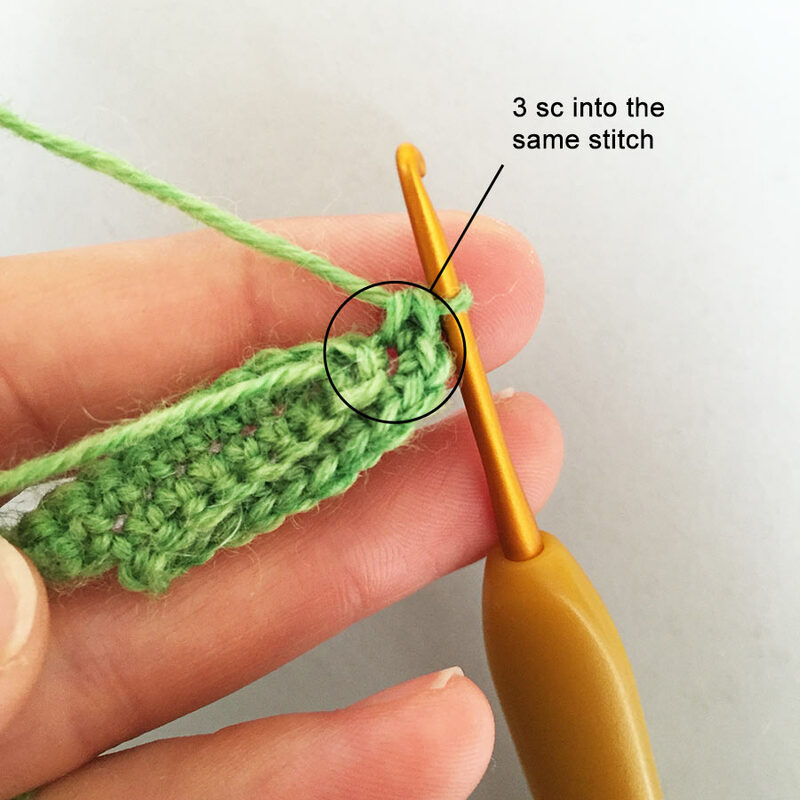 Pour assembler les feuilles, insérez votre crochet dans la m centrale du côté droit de la seconde feuille et crochetez-y 1ms. 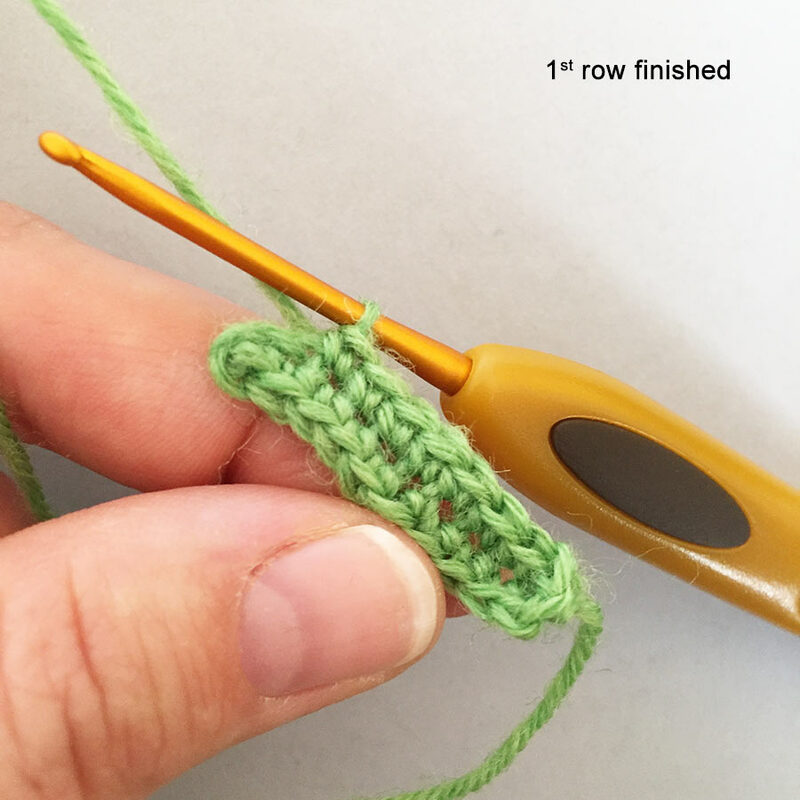 Crochetez 4ms le long du côté. Joignez toutes les feuilles de la même façon. 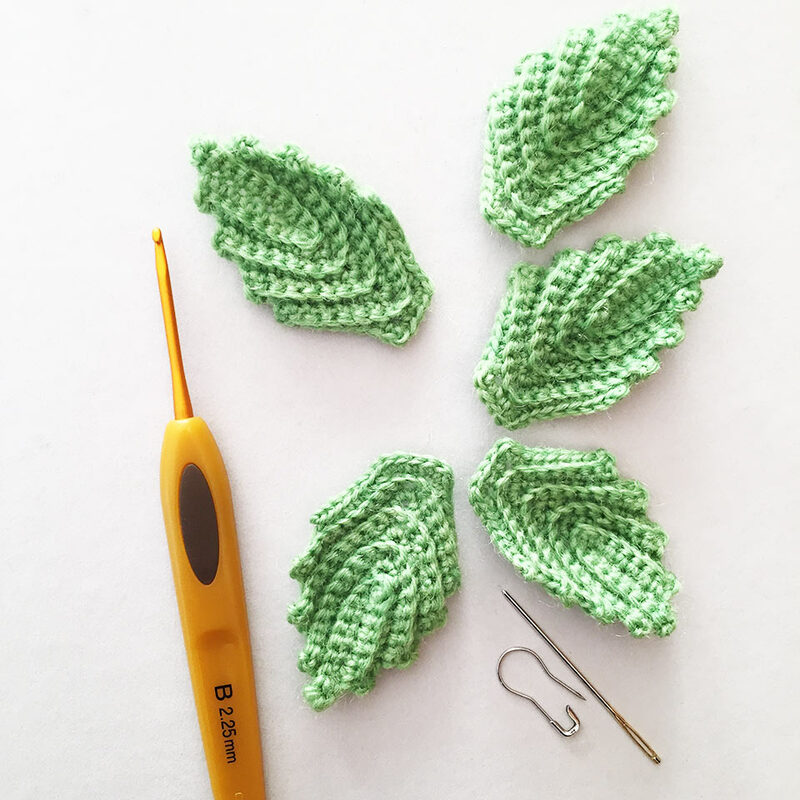 Lorsque toutes les feuilles sont crochetées vous aurez réalisé 25m. Vous devez maintenant les joindre en cercle. Pour ce faire, commencez le rg01 directement dans la 1ère m réalisée dans la 1ère feuille. A partir de maintenant travaillez en spirale. Placez un marqueur dans la 1ère maille afin de garder le compte des m réalisées. Coupez le fil et arrêtez les 5m restantes. Haal de draad op door een van de blaadjes in de middelste steek in de rechterbovenhoek (dit is de steek in het midden van de 3 vaste van rij 8). Haak eerst een vaste in deze steek en haak vervolgens 4 v langs de rand. Nu gaan we het tweede blaadje toevoegen. Steek je haaknaald door de middelste steek in de rechterbovenhoek van het tweede blaadje en haak hier 1 v. Haak vervolgens 4 v langs de rand van het tweede blaadje. Op deze manier maak je alle blaadjes aan elkaar. Als alle blaadjes aan elkaar vast zitten, zou je een rij van 25 steken aan elkaar moeten hebben. Nu gaan we van de blaadjes een kroontje maken. Begin de eerstvolgende toer bij de eerste steek van je eerste blaadje. Werk vanaf hier in een spiraal. Je kunt een stekenmarkeerder gebruiken zodat je de tel niet kwijtraakt. Knip de draad af en hecht de laatste 5 steken af. Prendi un sepalo e fissa il filo nel punto centrale dell’angolo destro del sepalo (dovrebbe essere il punto in mezzo alle 3 mbs lavorate nel giro 8). Lavora una mbs nello stesso punto e continua a mbs per altri 4 punti. Prendi un altro sepalo. Per assemblare i sepali, inserisci l’uncinetto nel punto centrale dell’angolo destro del secondo sepalo e lavora una mbs nello stesso punto e continua a mbs per altri 4 punti. Unisci allo stesso modo gli altri 3 sepali. Una volta assemblati tutti e 5 i sepali dovresti aver lavorato 25 punti. Ora bisogna unire la ghirlanda di sepali in un anello. Per fare ciò, inizia il seguente giro 01 direttamente dal primo punto lavorato sul primo sepalo. D’ora in poi dovrai lavorare a spirale. Per tenere il conto dei punti lavorati, inserisci un marker nel primo punto di ogni giro. Blocca, taglia e ferma il filo tra i 5 punti rimanenti. 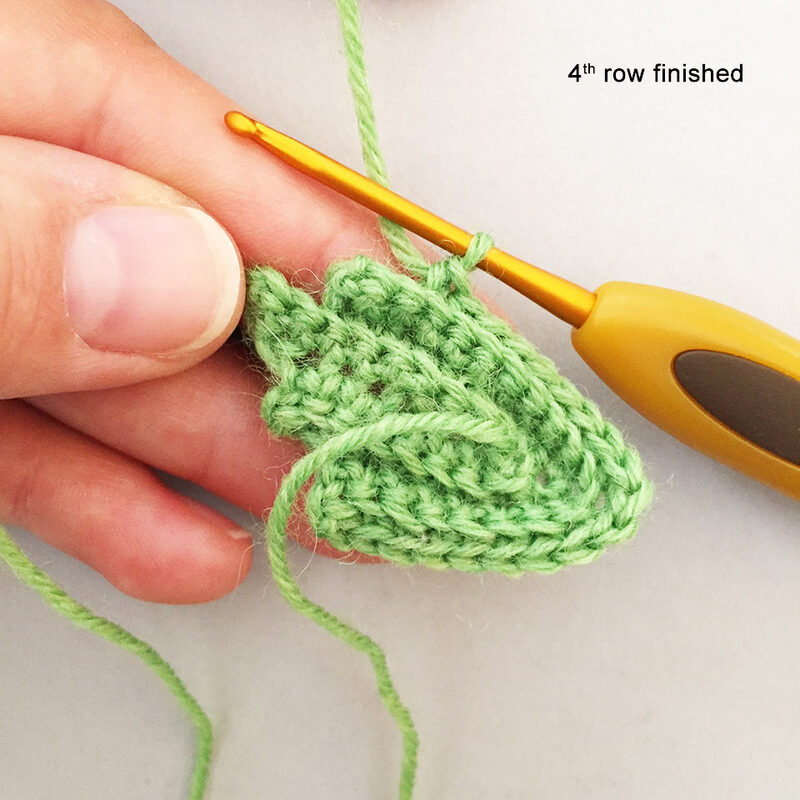 Before you sew the rosette onto the hood, you should fill in some soft stuffing into the stem. 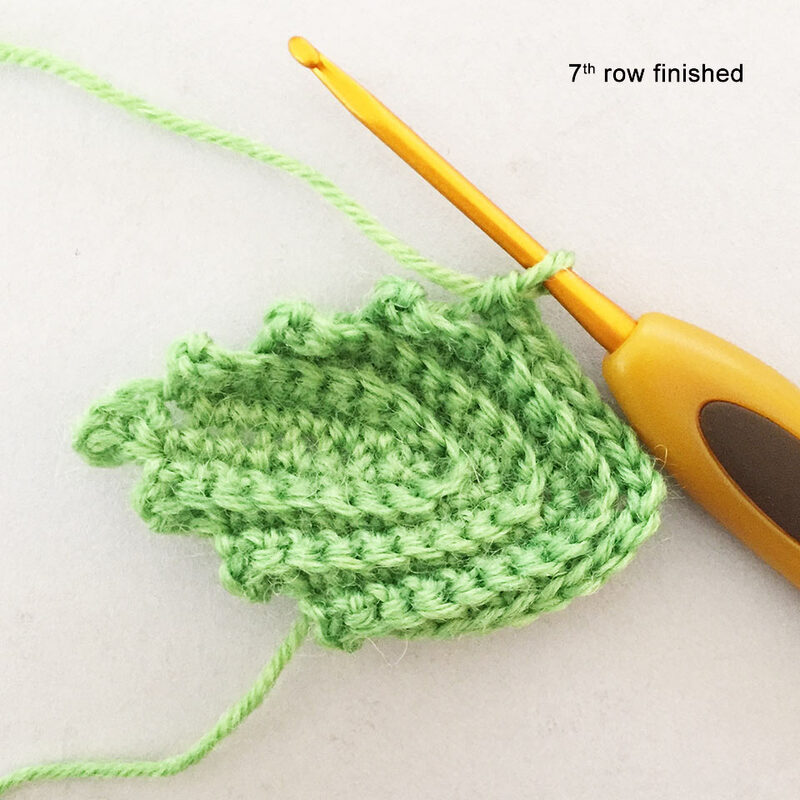 Place the rosette onto the hood slightly slopingly (see photos). 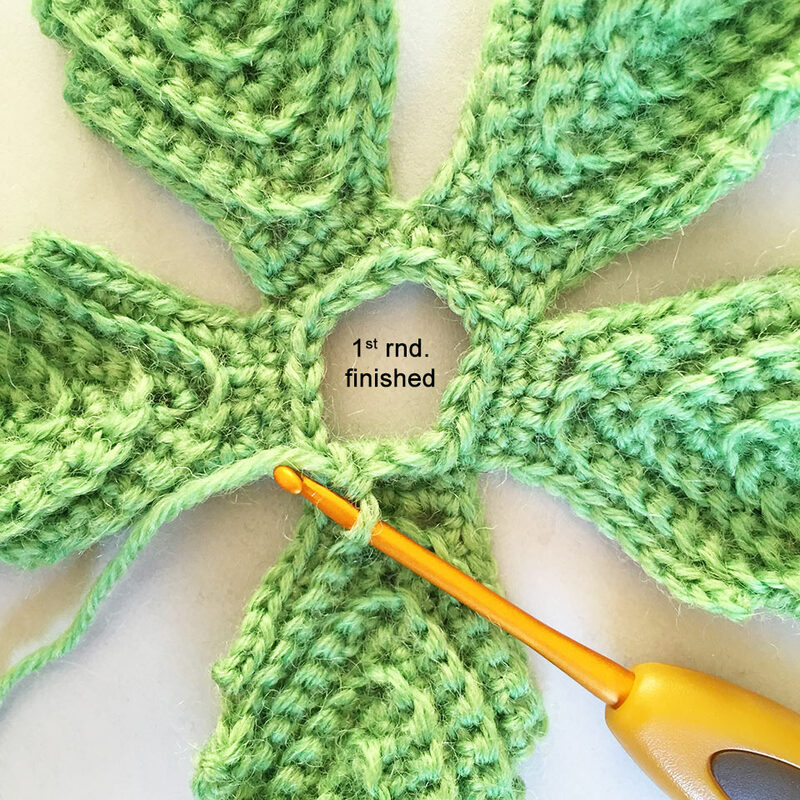 Now sew the rosette in place using the remaining yarn tails from the rosette. Bevor Du die Rosette an die Kapuze nähst, solltest Du etwas Füllwatte in den Stengel stopfen. Jetzt platzierst Du die Rosette ein bisschen schief auf der Kapuze (siehe Fotos). Dann kannst Du die Rosette rundherum an der Kapuze festnähen (Du kannst zum Nähen ganz prima die Garnenden der Rosette benutzen). Antes de coser la roseta a la capucha, deberás rellenar apenas el tallo. Coloca la roseta sobre la capucha, apenas ladeada hacia un lado (ver las fotos). Ahora cósela en su lugar usando la lana restante de las hojas. Avant de coudre la rosace sur la capuche, vous devez mettre un peu de rembourrage dans la tige. Placez la rosace sur la capuche (voir photos). Maintenant cousez la rosace en place en utilisant le fil restant. Het kroontje aan de kap vastmaken. Vul het stokje van het kroontje met wat zachte vulling voordat je het kroontje aan de kap vastmaakt. Maak het kroontje niet precies in het midden vast, maar een beetje scheef (zie foto's). Bevestig het kroontje met het eindje draad van het kroontje. Prima di cucire la rosetta sul cappuccio, dovresti imbottire lo stelo con dell’imbottitura morbida. Posiziona la rosetta - leggermente inclinata (vedi immagini) - sul cappuccio. Ora puoi cucire la rosetta sul cappuccio. I used approx. 70 beads (size: 3 mm) to sew them onto ERNA's body. The distance between the beads on the upper body is less then on it's lower part. 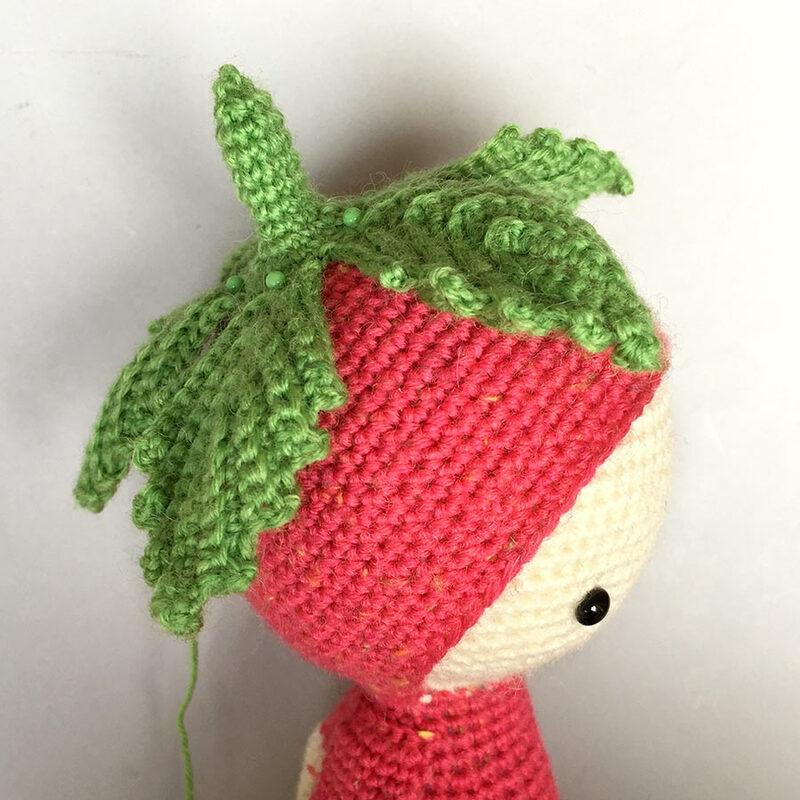 If you want to give ERNA to a child under the age of 3 you rather should embroider the seeds with yarn or embroidery floss. Ich habe etwa 70 kleine rosane Perlen (3 mm) als Samen an ERNA's Körper genäht. Der Abstand zwischen den einzelnen Perlen ist am berkörper kleiner als im unteren Bereich. 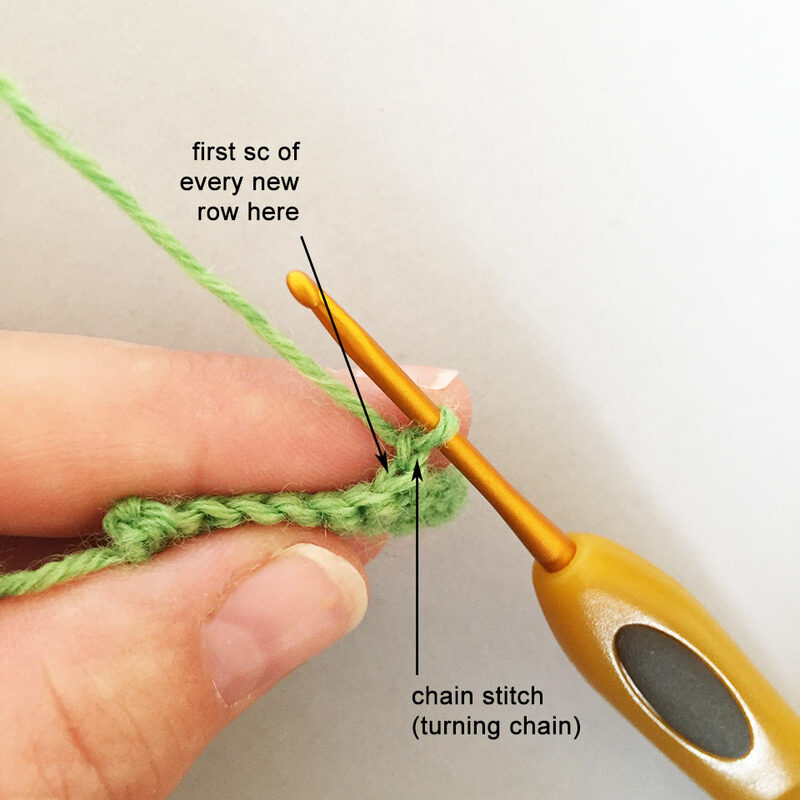 Wenn Du Deine ERNA für ein Kind unter 3 Jahren häkelst, solltest Du auf die Perlen besser verzichten udn die kleinen Samenkörner stattdessen mit etwas Garn oder Sticktwist aufsticken. Yo usé aproximadamente 70 mostacillas/canutillos (tamaño: 3 mm) para coserlas al cuerpo de ERNA. La distancia entre las mostacillas en la parte superior del cuerpo es menor a la de la parte inferior. Si piensas hacer a ERNA como regalo para un niño menor de 3 años, será mejor que le bordes las semillas usando hilo de bordar o lana. J’ai utilisé approximativement 70 perles de 3mm pour les coudre sur le corps. La distance entre les perles sur le haut du corps est plus courte que celle sur le bas du corps. Si vous désirez offrir Erna à un enfant de moins de 3 ans il est préférable de broder les graines. Pitjes op Erna's lijf bevestigen. Ik had ongeveer 70 kraaltjes van 3 mm nodig voor Erna's lijf. De afstand tussen elk kraaltje is kleiner op het bovenlijf en groter op het onderlijf. Als Erna bestemd is voor een kind jonger dan 3 jaar, kun je deze pitjes beter borduren met (borduur)garen. Io ho cucito circa 70 perline (dimensione: 3 mm) sul corpo di ERNA. La distanza tra le perline sulla parte superiore del corpo è minore rispetto alla distanza tra le perline sulla parte inferiore del corpo. Se stai realizzando ERNA per un bambino con età inferiore ai 3 anni, ti consiglio di ricamare dei semini utilizzando del filato da ricamo o simile. 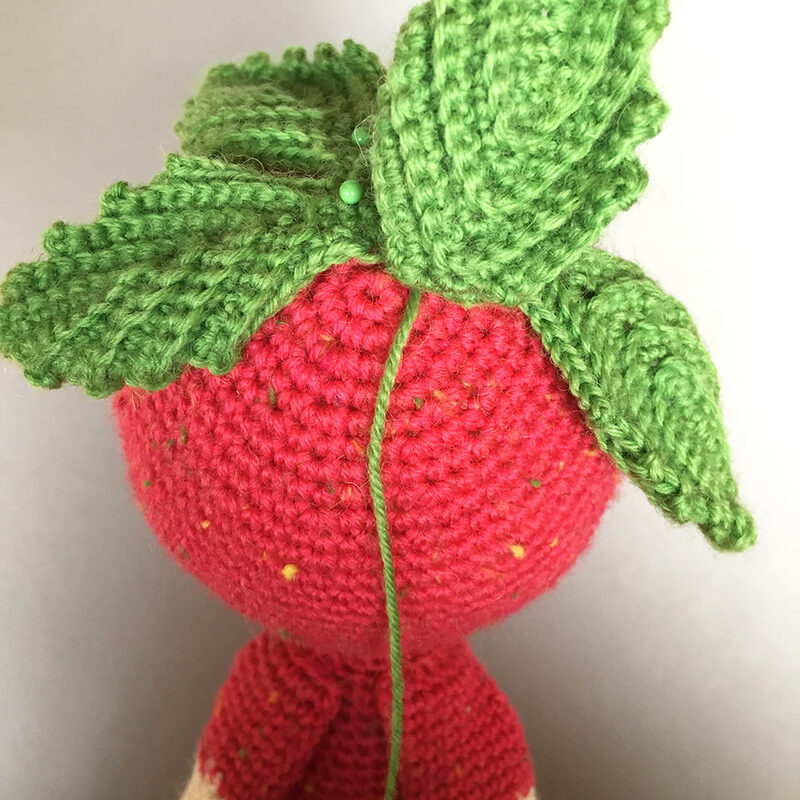 You want to crochet those little strawberries and blackberries you spot on some of ERNA and BERT's photos? Go ahead!